The Chinese government utilized its propagandist state-television service the Xinhua agency to “release a message from Chinese astronauts in space,” but is now left embarrassed after proof surfaced the men never left mother Earth. The Xinhua agency is a well-known propagandist network, which publishes any bizarre dog whistle that the Communist government feels is necessary to lie about, leaving many unsurprised. The article began by proclaiming the men were in orbit of the Earth, inside the often-criticized Shenzhou VII spacecraft, dubbed as a cheap clone of American craft decades prior. “First-level measurement arrangement," the article claims one taikonaut said, which if you didn't know- is the Chinese word for astronaut. The propagandist piece even fantasized about the reaction that Chinese people were to have to the mission has been a success. Their article later described the reaction to a successful outcome of the mission. "Ten minutes later, the ship disappears below the horizon. Warm clapping and excited cheering break the night sky, echoing across the silent Pacific Ocean." For China, it would have been a huge victory. There's just one little problem, well, a few. China has never sent a man into space that has ever stepped outside of their spacecraft, and this was supposed to be a historic moment for the Chinese space program. A taikonaut was set to make China's first-ever manned spacewalk, achieving what the US and Soviet Union were able to do a nearly three-quarters of a century prior. The “First American Spacewalk,” a historic win for the United States of America, happened during the Gemini 4 mission on June 3, of 1965. That's when Astronaut Ed White became the first American to conduct the spacewalk. However, the first <i>ever</i> spacewalk had already been performed, and that occurred at the hands of Soviet Cosmonaut Alexei Leonov on the Voskhod 2 in March of 1965. NASA moved up their spacewalk from the original schedule, to demonstrate that the US was gaining on the early lead taken by the Soviets in what was known as the Space Race. NASA would score again when they fulfilled the John Fitzgerald Kennedy dream of reaching the moon. Apollo 11 was the first manned mission to land on the Moon. The first steps by humans on another planetary body were taken by Neil Armstrong and Buzz Aldrin on July 20, 1969. The astronauts also returned to Earth the first samples from another planetary body. 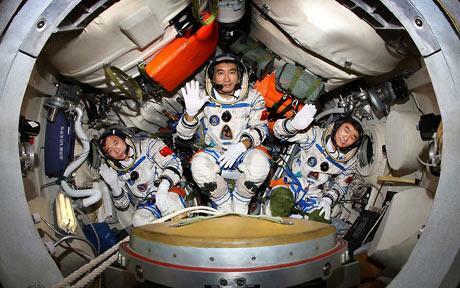 China's most ambitious manned space mission blasted off intent on providing the country's first-ever spacewalk. China has increased their development and tests of Project 921, in trying to build hype around their race into space. This is essential to China's emergence as a global superpower, coming on top of its hosting of the Olympic Games, and already strengthened military and manufacturing sectors. However, Asian rivals such as the US-backed Japan and the US-backed India are also ramping up efforts to voyage into space, as well as Donald Trump's own “Space Force” about to take liftoff in America. President Trump has also expressed interest in returning to the moon. This comes amidst an already heightened tensions thanks to the ongoing “trade war” of the US and China. Now, the United States has something to poke fun at the Chinese over and surely will be used in future wars of words from the President of the United States of America. The Earth is flat and space is fake. All space agencies are faking, just China is bad at it because gooks can only ever manage to poorly clone Western ideas – originality is anathema to the gook mind.